Abstract: A 61-year-old male with a prosthetic St Jude aortic valve size 24 presented with heart failure symptoms and minimal-effort angina. 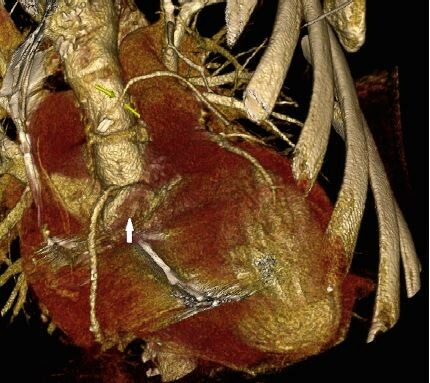 Eleven months earlier, the patient had undergone cardiac surgery because of an aortic root dilatation and bicuspid aortic valve with severe regurgitation secondary to infectious endocarditis by Coxiela burnetii and coronary artery disease in the left circumflex coronary artery. Then, a prosthesis valve and a saphenous bypass graft to the left circumflex coronary artery were placed. The patient was admitted to the Cardiology Department of Hospital Universitario de Canarias, Tenerife, Spain and a transthoracic echocardiography was performed that showed severe paraprosthetic aortic regurgitation and an aortic pseudoaneurysm. The 64-slice multidetector computed tomography confirmed the pseudoaneurysm, originating from the right sinus of Valsalva, with a compression of the native right coronary artery and a normal saphenous bypass graft. On the basis of these findings, we performed surgical treatment with a favorable postoperative evolution. In our case, results from complementary cardiac imaging techniques were crucial for patient management. The multidetector computed tomography allowed for a confident diagnosis of an unusual mechanism of coronary ischemia.